The new generation of self-adjusting magnetic rigs emerging throughout 2017 have been one of the hottest topics for debate among tube fed shotgun competitors. To bring you the answers you deserve, free from conjecture and based solely on empirical evidence, we pointed our (almost) tame scientist and British Senior Standard Champion, Professor Mike Siva-Jothy, at the job. Armed with nothing more than a Taran Tactical Benelli M2, over £1000 worth of new rigs and a brain the size of a planet Mike has found the answers that have been so eagerly awaited by so many poised on the brink of investing in a new rig. Online forums and groups are full of people asking “which gun should I buy?” and “which loader is best?” followed by a tsunami of opinions. After reading one of these crock-fests about adjustable quad loaders I decided to try and bring some rationality to the debate. There is, of course, a shed-full of problems in one person conducting a review like this. First, I use two of these loaders myself (and am sponsored by one of them) – so any review I write is open to the accusation of being biased (ED – however if this review was biased it would not be published on practical-shotgun.com). Second, by virtue of my training and set-up I will always favour the rig I am most used to (also one of the rigs in the review). Third, I have no intention of judging which rig is best – I have a favourite, but what is best for me may not be best for you. Finally – this review is about three pieces of gear that didn’t just magic into existence – they are the result of years of work, research, and thought – so I thought it would be appropriate to give some background on the people who have poured their hearts and souls into making this equipment. The first thing I want to knock on the head is the frequent exclamation from Facebook numptys about the extortionate cost of these rigs. I have little time for people who don’t understand the standard of high-level competition in PSG or the amount of cutting edge technology and design that goes into these bits of equipment. It’s the equivalent of walking from a Dacia showroom to a Mercedes showroom and exclaiming how over-priced the Mercedes is. They cost more for a reason. (ED – we’ve talked about this, Mike, stop beating about the bush and say what you’re really thinking). All the loaders I review here are manufactured in Europe, using the latest production techniques and cutting-edge materials. For example, the back plates are all drilled after they have been curved. This is an expensive and difficult process – it could be done cheaply and most people wouldn’t notice – but all the rigs have done this because it produces a more reliable and longer-lived product. The pricing of these rigs is very competitive given the size of the market and the sophistication of the technology. If you can’t, or wont, pay for this gear, then go down the food-chain (where there is good, cheaper but less effective gear) and please spare us the uninformed indignation. King Competition Products have always been at the cutting edge of this game. Their co-owners, Kim Leppänen and Jaakko Viitala, are legends on the shotgun circuit, and are trained engineers. They started making loaders in 2014 (at about the time they joined the Finnish national team prior to the Shotgun World Shoot 2 in 2015) and quickly realised their engineering and shooting skills allowed them to innovate their shooting techniques through the design and engineering of their equipment. They came up with the first magnetic shotgun shell holder system (Gen 3) that made its debut at the World Shoot 2. Kim took a World title and Jaakko took a Silver and the rig was used by 12 world championship medal winners (which is testament to the innovative leap they facilitated). I remember being introduced to Jaakko and Kim (by the beer tent – where else would you bump into Finns?) and being blown away by the ingenuity and practicality of the Gen 3 rig. I wasn’t the only one who realised King had redefined competitive PSG: the tsunami of interest from shooters at WS2 resulted in the commercial production of the Gen 3 rig and the birth of the company. Feeding on Kim’s experiences from 3-gun shooting in the USA in 2016 and Jaakko’s testing and experimenting through the year, they designed and made the self-adjusting Gen 5 rig which was released in spring 2017: King upped the ante yet again, but not because they had designed out the problem of dealing with different shell lengths, but also because they had made the whole rig more compact. 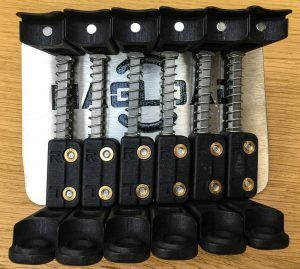 No one would dispute that King’s dominance in the competitive shooting market is down to the innovation they bring from their competitive shooting and the engineering insight they bring to solving technical problems. Magload’s Christopher Constantine (Conners) is the brains behind Magload. Conners started shooting PSG just before 2015. Having a practical, solution-based approach to his shooting he quickly realised that the plastic-clip-based loaders could easily be improved and started to experiment with loaders for his own use. His primary design aims were (1) to make the release as light as possible, and (2) to give new shooters a forgiving “grab and pull” during quad loading. Shooters at his club started asking if the rig was for sale, and before long they were flying out of his workshop. The company name is derived from “Magnetic Loaders” and Conners admits he was not in it to make money but was happy that people wanted to buy his gear. It subsequently became clear that people hated having to adjust loaders for different shells: Conners first solved this problem with wingbolts, then a quick release lever, and by January 2017 had started design work on the Nexus (figure 2). This project aimed to allow the loaders to be in continuous alignment and save space. Development was soon linked with modularity and the ‘Self Adjust’ System. The Nexus was born and became commercially available at the end of November 2017. EZLOAD is Magnus Gustaffson’s brainchild – Magnus has been a keen, and talented, shooter since he left Swedish military service in 1995. He was introduced to IPSC shotgun after moving (with his job) to the UK in 2010. At this time the loader of choice was the caddy and Magnus realised there were faster ways to load. He bought himself a Chameleon Duo rig and immediately began modifying it for quad loading. I remember seeing him at L3 matches with a crazy rig held together with zip-ties and gaffer-tape – but the skeptics soon realised it worked better than caddies or the deuce load system. Magnus shot through the ranks and easily qualified for team GB at the World Shoot 2 – and much of what he builds into his designs comes from his experience and understanding from shooting at this level. After the World Shoot 2 Magnus focused on streamlining and improving the designs then on the market and building them into his vision for an effective loader. At this stage Magnus wanted to make a competition-level rig for himself and had no intention of selling it – but when his shooting peers saw how easy it was to use the demand drove the commercialisation and EZLOAD was born in late 2015 and the EZLOAD nxtgen (figure 3) came to market in December 2017. Magnus recently moved back to Sweden, and became a father, in early 2017 – he is now back up to speed with shooting, the loaders and his sleep. So that is how these products got to market. No one here is out to make a quick buck. They are all passionate and dedicated shooters who have taken different approaches to the design and production of their kit. This is exactly the kind of ecosystem that benefits shooters: we have choice and its driven by passion, insight and understanding. All three companies use cutting-edge technology, materials and manufacturing processes – and all three companies drive the market forward in a way that benefits us. The King Gen 5 is a thing of beauty – a Geigeresque apparatus that wears its engineering quality and self-confidence on its sleeve. It is eye-catching and full of ‘adaptability’. The Magload nexus is striking in its simplicity: it’s a lovely example of practical design. Magload has joined the dots in the shortest most efficient way and focused on function. The EZLOAD nxtgen is a clever bit of tidy-minimalist design. It is uncluttered and handsome (a bit like Magnus). This rig has taken a very different approach to the design with the result of a very nice minimalist aesthetic and understated practicality. No one is going to feel short-changed after unpacking any of these loaders. However, it is my job to cast a critical eye over this gear and it would be unrealistic to run a review like this without doing side-by-side comparisons. So here goes. None of what I am going to whine about here is a deal-breaker. There are no donkey’s in this race so I’m going to focus on the issues that matter to me as a shooter – your mileage may vary. I’ve broken down my critique into the aspects of the loaders that warrant discussion. I have also provided a side-by-side comparison in the table that highlights key differences between, and aspects of the rigs. Back plates and footprint. The King has the spring-loading outside the shell storage area making it considerably deeper from top to bottom than the others (which have the spring-loading inside the frame). This will have constraints on where you wear the rig and how much forward bend you have. The upside is that there is a lot of real-estate to secure Velcro. This rig is very stable on the wide belts that are popular with competition shooters. The Magload has used the ‘internal’ spring loading as a driver in the design for left-handed and right-handed options in the same rig. The consequence is that the Magload backing plate is longer from end-to-end, and shallower from top to bottom than the others: it sticks out from the edges, but there are fixes for this. The left-right switch option will be really appreciated by shooters who are getting to grips with their options and ability (a real plus of this rig) but the relatively long and narrow (steel) backing plate will probably get its protruding ends ground down once the owner has settled on how they want to mount the kit. 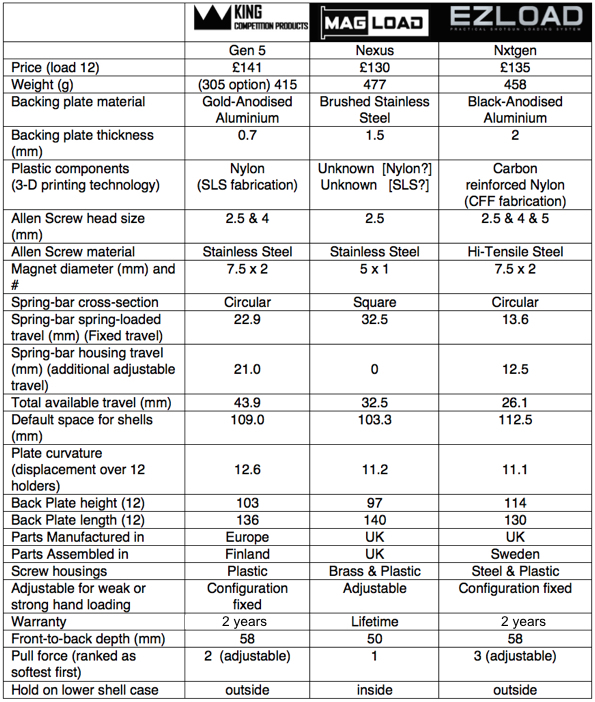 Whilst a proprietary low-density steel alloy is used, the plate is still heavier than the others. Why is weight an issue? Because every little matters. The shape and weight of the Magload means a Velcro attachment to a wide belt will be less robust that the other two (the depth of the Velcro is critical because of the tearing motion in stripping the rounds). So the Magload is probably better suited to a tech-lok or screw attachment to a belt. Maintenance. The King and the Magload have their guts exposed, whilst the EZLOAD has everything tidied away inside a housing. The EZLOAD design may have advantages when the going gets muddy / dusty, but could also cause issues if the gear needs maintenance on the fly. Conversely the exposed rigs may not be as vulnerable to dust as they appear – I have not heard of problems from users of the King even at sandy ranges like Phillipsburg. I have diss- and re-assembled all the rigs: the Magload is simplest, the EZLOAD next and the King the most complex. Nonetheless, none of them are so complicated that you couldn’t do a repair between courses of fire (assuming you know how your rig works). Ergonomics. The King has the thinnest back plate and very compact holders (it is also the lightest rig). The consequence is that the backing plate can be (and is) curved to a greater degree than the other rigs. This is a double edged sword. Skinny to medium sized shooters (and I include myself in the upper end of the latter category) will be happy to have a snuggly curved plate on their waist. However, if you are a champion pie-eater you might struggle with the King’s short radius. I have asked Stephen from Practical-Shotgun.com to comment about this issue and he assures me he will report back once he has finished his kebab. (ED – cheeky…. my 28 round King Gen 5 is a perfect aerodynamic fit on my athletic frame). The EZLOAD has a longer radius and the same “depth” between the shells and the back plate as the King. If you have a wider waste and bigger fingers, you might find the EZLOAD a better option. The Magload is very compact between the shells and the backing plate – this compactness was no problem for me (and I have big hands) and probably wont affect most shooters. Screws. The King and the Magload have stainless steel allen screws which carry slightly more risk of stripping the hex-pit in the head, I have done this several times with stainless screws. (ED – buy some proper fitting allen keys and put them on your expenses claim, Mike). The EZLOAD has high tensile steel hex screws, so has a much firmer engagement and almost zero risk of stripping. You WILL have to disassemble your kit at some point – so this is not a trivial bit of nit-picking. 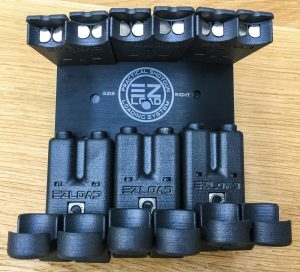 The EZLOAD uses three different sized screws, the King uses two and the Magload uses only one – this makes field maintenance and organisation easier, especially if you have to do it between courses of fire in a hurry. Performance. All three rigs have a very nicely weighted and balanced grab and pull. I spent a lot of time trying to quantify the force required, but quickly realised that its impossible to get a meaningful measure with a single-sensor force gauge because of the complex way we grab, twist and pull. So, I’m relying on a subjective assessment from series of pulls with different length shells. The Magload is by far the lightest and most forgiving grab. The single magnet and tightly cropped top holder also means there are lots of grab and hold options: This will make it attractive for beginners. The King and the EZLOAD are pretty much optimised for competition loading and very similar in feel and presentation on the grab. They are unforgiving, and unapologetically, competition-tuned (compared to the Magload’s forgiving, but light-weight hold). Both the King and the EZLOAD can have their spring tension adjusted (and there is more “give” in the King – but both are set up at about the right tension out of the box). Its also worth noting that the lighter hold by the Magload means you can potentially ‘shock’ shells out of the loader if you jar or stop suddenly – I suspect you would have to do something pretty brutal (I have seen shooters slip and land flat on their backside and continue shooting – so it does happen). All three rigs have enough travel to cope with a pair of stacked 70mm round as well as the longest round I have in my bag (Remington buffered buck). Even when pushed to the limits of their spring’s range all the rigs provided a nice ‘linear’ change in release force required. Design, manufacture and cost. A really nice touch on the Magload is the square cross-section spring rods. This means the lower carriers do not rotate as they are loaded. The rotation with circular rods means the top and bottom shells can be slightly misaligned. 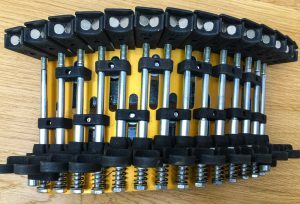 The Magload also has brass helicoid threads for the screws holding the spring bars in – a nice bit of over-engineering – whilst the EZLOAD has stainless steel inserts. The King goes straight into the plastic – which is perfectly robust. The quality of the 3-D printing is impressive in all the rigs – no quibbles with any of them. Top-drawer nylon base-material and professional printing. The EZLOAD’s use of graphite re-enforced nylon is a nice bit of over-engineering: this material has similar properties to high-tech metals, but at a fraction of the weight. Magload offers an upfront lifetime guarantee on all parts, which is pretty impressive. Whilst King and EZLOAD don’t put this in writing, its important to note that the people running the companies support and listen to their customers. King offer the normal industry warranty, which is 2 years but this isn’t quite the full story. They keep spares for every product even after its been phased out. A case in point was a failure I had on a shell picker – King replaced the broken unit and the housing (which was fine) free of charge and without any quibbles. EZLOAD has a similar policy – the normal industry warranty (2 years), but support and parts beyond this time. 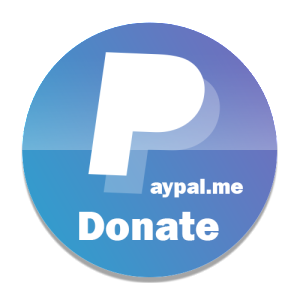 Still – Magload’s promise is in black and white. There is £10 between the most expensive 12 loader (King) and the cheapest (Magload) with EZLOAD bang in the middle at £135. As I have said before, given the amount of technology in these rigs, they are pitched at a reasonable price-point. It is my view that the King and EZLOAD rigs are aimed at, and tuned for, the competitive shooter who knows what they need, and want (and are probably returning customers). The Magload has one eye cocked at the first-time quad-loader who has realised that competition is the way forward and wants to take the plunge and experiment with their style and approach. All the rigs are beautifully put together. I have some gripes with some aspects of some of the kit – which I am not going to air here because they are subjective preferences / dislikes. There will be lots of shooters on the range strutting their new loaders in the 2018 season so my advice is ask to handle them and see what you think before you splash out. Finally I would like to salute Kim, Jaakko, Conners and Magnus for their continued passion and enthusiasm and for helping our sport be Diligentia, Vis, et Celeritas. Is there a distibutor in canada ? If not where can I buy a 12 rack ? I live in british columbia canada..